CasaTunes Air is an AirPlay switch that is built into all CasaTunes music servers. CasaTunes Air allows you to receive AirPlay streams from one or more iOS devices, as well as stream your CasaTunes music to one or more AirPlay speakers and devices. You can enable or disable receiving AirPlay streams, and transmitting CasaTunes music to AirPlay speakers and devices in CasaSetup. By default, CasaTunes publishes every CasaTunes room and room group as an AirPlay speaker. This allows you to stream music from your iOS devices to any room or room group in your home. You can stream from as many iOS devices as you have streams. For musicBox music systems the number of streams is 4. When you AirPlay from an iOS device to a CasaTunes AirPlay Speaker, CasaTunes automatically powers on the room when you connect, and powers off the room when you disconnect. 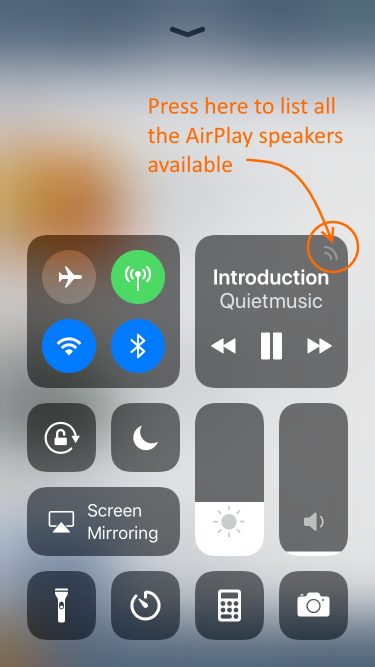 You can also change the volume in the room by using the volume buttons on the side of your iOS device, or using the volume settings in the music App. Keep in mind that when you AirPlay to a CasaTunes AirPlay Speaker, you don't have to open the CasaTunes App. When you pause or disconnect the AirPlay stream, CasaTunes will, by default, turn the room off. If you would like the room to resume playing the music that was playing prior to the AirPlay stream, uncheck Always turn off the room when the AirPlay stream disconnects. Many iOS music Apps include an AirPlay icon and the option to select an AirPlay speaker from within the App. When you select the AirPlay icon in these Apps, the App will display the list of AirPlay speakers, select the CasaTunes room or room group from the list. If the iOS music Apps does not provide a built-in AirPlay option in the App, you can still use AirPlay with the App. In fact, every music App inherently supports AirPlay. If you want to AirPlay the same iOS stream to more than one room, you can either create a room group and target the room group, or you can use the Share music option in the CasaTunes App to share the music in one room, with any number of rooms. You can also stream music from most music Apps on your Mac using AirPlay, by simply pressing the Option key and clicking the Speaker icon. A list of AirPlay rooms is displayed. Note: Apple often changes the way users connect to AirPlay speakers with different versions of iOS. The image shown is for iOS 11. With CasaTunes Air, you can send music from your musicBox music server to any wired or wireless Apple AirPlay networked devices, such as AirPlay Speakers; AppleTVs (Version 3 or less); and Audio Video Receivers with built-in AirPlay. You can use CasaTunes Air to expand your existing wired system and add additional rooms by using a combination of both, wired and wireless speakers, and thanks to CasaTunes’ continuous synchronization, your wired and wireless speakers will be perfectly synchronized. 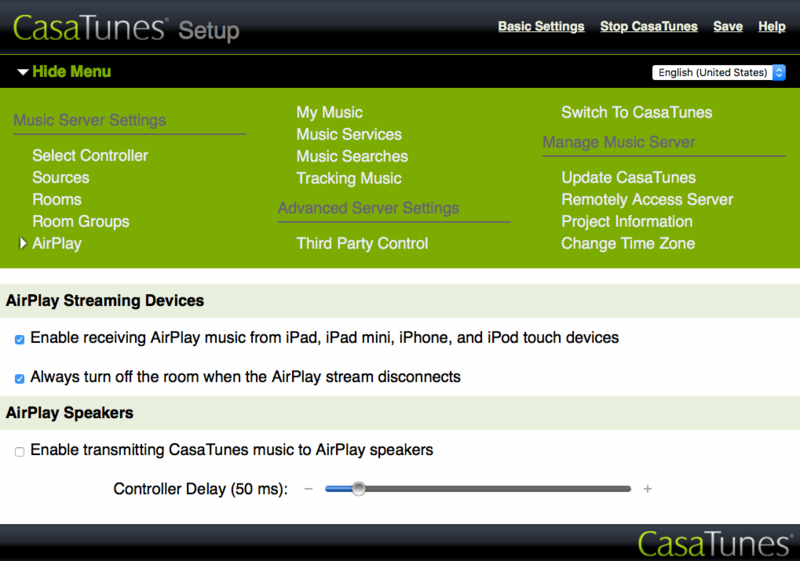 The number of wired and wireless AirPlay devices CasaTunes supports depends on the CasaTunes music server you have. We recommend no more that 3 AirPlay devices. Apple, Apple AirPlay, iOS, AppleTV, iPhone, iPad and iTunes are trademarks of Apple, Inc registered in the US and other countries. All other products and services may be trademarks or service marks of their respective owners.